Available in English through Amazon Paperback | Kindle eBook. Available in Bulgarian translation from Znatsi and Helikon Bg. 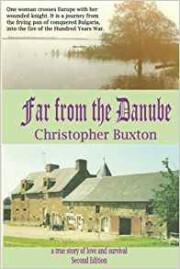 Far from the Danube was published in the autumn of 2006 following four years of research and travel in Bulgaria, Italy and Normandy. It was printed in Bulgarian and English versions by Kronos Publishing house. 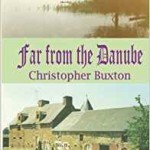 Far from the Danube is a novel based upon a real event, recorded in the Norman pipe rolls of 1419. An attractive woman, Maria Iskra, appeared before the English King Henry V to secure rights to land in Normandy on behalf of her son. She carried with her a document, dictated and signed by Gilles Guiton in 1401, acknowledging the son as his legitimate heir and referring in brief to the fact that Maria Iskra had saved his life and travelled with him across Europe. Far from the Danube is an imaginative but realistic retelling of Maria Iskra’s story. It begins with the catastrophic Nikopol crusade, where in 1396 an over-confident international crusading army was defeated by the Turkish sultan Bejazit. Gilles Guiton, a young Knight of the Hospital, was part of that battle. Unlike most of his compatriots, who either died on the field or were executed or enslaved, he survived in spite of terrible wounds. Maria Iskra evidently rescued him, nursed him back to some health and managed to accompany him on a three year journey back to Normandy. On the journey she bore him a son. Sadly, Gilles only lived two more years after his return. Until the French revolution, a brass effigy lay over his grave in Carnet church. She lived on in a strange and eventually war torn land for a further fifty years, able to see her son’s rights recognised by both English and French kings, therefore deeply embroiled in the shifting power politics of the latter stages of the Hundred Years War. The first half of the book relates the strengthening complex relationship between the two main characters on their journey from Bulgaria to Normandy, via Italian city states and the Rhine. Considerable tension is created at the beginning of the book by the fact that Gilles, a younger son of a family owning considerable property around the villages of Carnet, Argouges and the town of St James, was a “Knight monk”. As a knight of the Hospital he would have taken a vow of chastity. The second half of the novel tells of the inevitable friction between Maria and Gilles’ family following the death of Gilles and of her later parlous position occupying land right in the centre of conflict between English and French. Four significant characters emerge: her son, Jehan Guiton, later to be ennobled by the French King; Gilles’ nephew, Jean de Carnet, a hero in French history and ruthless guerrilla fighter against the English and French collaborators; Thomas Rempstone, an English commander, and Tanguy de Chastel, a Breton knight and ex-mercenary. Maria Iskra is forced to play a dangerous role in seeking to placate all four of them, at a time of constantly shifting fortune.